Very recently I was centre podium, smiling as a Rio Paralympic gold medal was placed around my neck. I had won the women’s handcycling H1-3 time trial. It had been a goal for four years, ever since winning a silver medal in the London 2012 Paralympics. I thought I would cry if I won the gold; I’d been close to podium tears a few times before, not for myself but happy for my favourite competitors to win World Champion jerseys in the past. I had for a long time set my dream and hope on my turn for gold being in Rio. With the heavy medal around my neck at last, I was a surprised that the tears didn’t come. In fact, I felt little at all except a kind of dumb-founded numbness. A few tears seeped when Facebook delivered the first messages of congratulations, feeling the support of friends and acquaintances delivered via cyber-world. The comments or messages are still coming almost daily. “You must be on cloud 9”; “I hope you are enjoying your success.”; “It’s been so wonderful to follow your journey and see you win gold.” What wonderful messages to be receiving. The only thing is that they are totally at odds with how I have been feeling. I want to reply and gush my enthusiasm. I want to say what a fantastic time it has been. But the truth is, since Rio, I have been living in a haze. I have been going through the motions; my body and soul have felt broken. 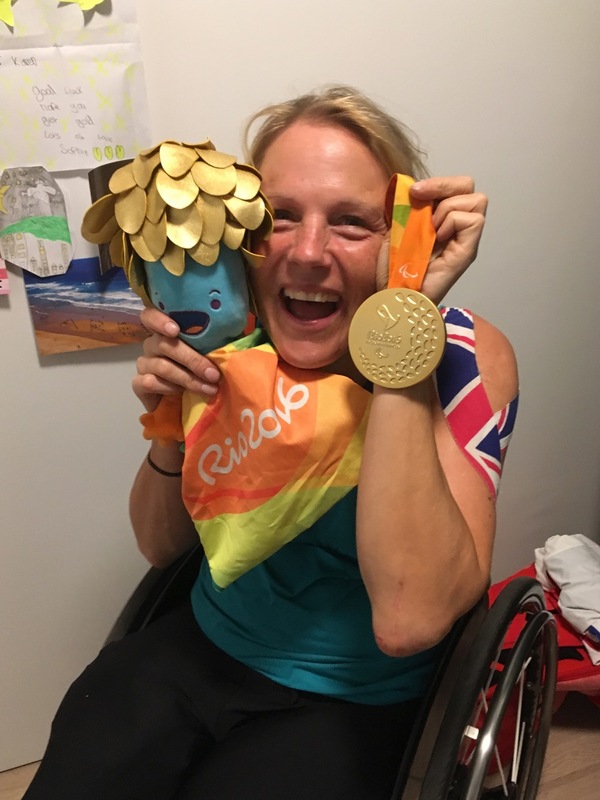 Six weeks before the Paralympics I was forced to spend two weeks lying on my stomach to heal a mild pressure sore that I’d developed from cycling. The week before flying to Rio I had emergency root canal treatment and acquired an injury climbing into a gold buggy at our training camp. I was reaching breaking point. Since then my shoulder has barely been able to get me through the basic requirements of daily living. All of this and recent shoulder scans, physiotherapy and proposed surgery have forced me to reflect. I have been in a pressure cooker for four years. In those four years I have temporarily lost arm function after nerve damage from a car hitting me whilst training. I have picked myself up so many times and kept working for the gold. I have been under so much pressure for so long; largely from my own decision to work for gold. I ask myself why I feel so dazed right now, why life is so foggy, why my body feels so exhausted but when I reflect back on the journey to becoming Paralympic Champion, it is hardly surprising! The goal, going for gold, the training, the pressure…they are all choices that I made, and whilst I’m a little broken right now, they are not choices I regret. In so many ways it has been an amazing experience. I have learnt, and am still learning a lot. I’m now in the process of slowing down my internal metronome, recuperating in my favourite island of Mallorca (a close equal with the Outer Hebrides but the weather wins! ), reminding myself that “La vida es un viaje, no es una carrera”. Life is a journey not a race, but having trained to race for four years, it is an interesting shift of perspective. My body is leaving me little choice though. It wants a break. Despite Channel 4’s billing, I am not Superhuman. I happen to be paralysed and have a passion I have chosen to pursue, perhaps to the point of obsession. I LOVE to ride my bicycle, but for the first time in my lifetime, I have fallen a little out of love. Habits aren’t easy to break, so I have been riding; but mostly I have felt sick at the thought of climbing into the saddle. My bike has been my reliable friend, some might say my partner, for years. I feel a little lost now I like hanging out with it less. But someone reminded me that all good relationships sometimes need time apart, to help things flourish again. Meanwhile, ‘Stay well in mind and the body will follow,’ I tell myself. I managed a mini-break to the Outer Hebrides; a boat rocking its way across a rolling swell is a great way to force a rest. A seascape and a whisking from a wild wind up on deck never fail to blow some of the junk away.